economic, and political decision-making process in humans. ﻿Social interactions rely on the ability to anticipate others' intentions and actions, and identifying neurons that reflect another individual's so-called "state of mind" has been a long-sought goal in neuroscience. A study published in the journal Cell reveals that a newly discovered set of neurons in a frontal brain region called the anterior cingulate is used in primates to predict whether or not an opponent will cooperate in a strategic decision-making task, providing information about the inherently unobservable and unknown decisions of others. By shedding light on the neuronal basis of cooperative interactions, the study paves the way for the targeted treatment of social behavioral disorders such as autism spectrum disorders. Previous studies have shown that brain cells called mirror neurons reflect the known and observable actions of oneself and others. But these neurons do not represent another's imminent decisions or intentions. While neurons that predict another's intended actions have been widely hypothesized and are a cornerstone of many theories on social behavior, their existence had never before been demonstrated. Moreover, past research on the neural basis of social behavior has focused on competitive interactions, leaving it unclear how the brain allows us to interact in mutually beneficial ways. To address these gaps in knowledge, researchers studied mutual decisions in macaque monkeys while recording from neurons at the back of the anterior cingulate, which is involved in learning social information and is connected with other brain regions that play a role in interactive behavior. In successive trials of the classical prisoner's dilemma game, a joint-decision task, two monkeys sitting side by side simultaneously chose whether to cooperate or defect by moving a joystick to select different options shown on a screen in front of them. 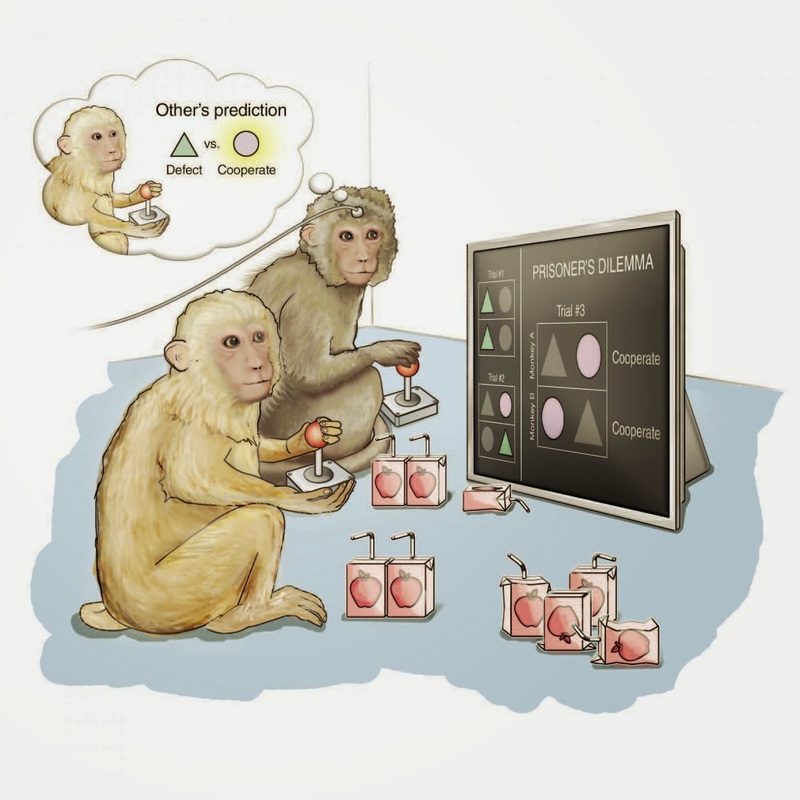 A monkey received the largest juice reward when it decided to defect while the opponent chose to cooperate, whereas both monkeys received a lower reward for mutual cooperation and the lowest reward for mutual defection. Moving forward, the authors will continue to explore how complex interactions are encoded in the brain, with the goal of developing new treatments for social behavioral disorders. "The electrical stimulation technique we used is very similar to what is currently used with deep brain stimulation for treating disorders such as depression and obsessive-compulsive disorder. This study may therefore help guide the future treatment of medically intractable disorders such as autism and antisocial personality disorder, which are often characterized by difficulty with social interactions", the researchers concluded.